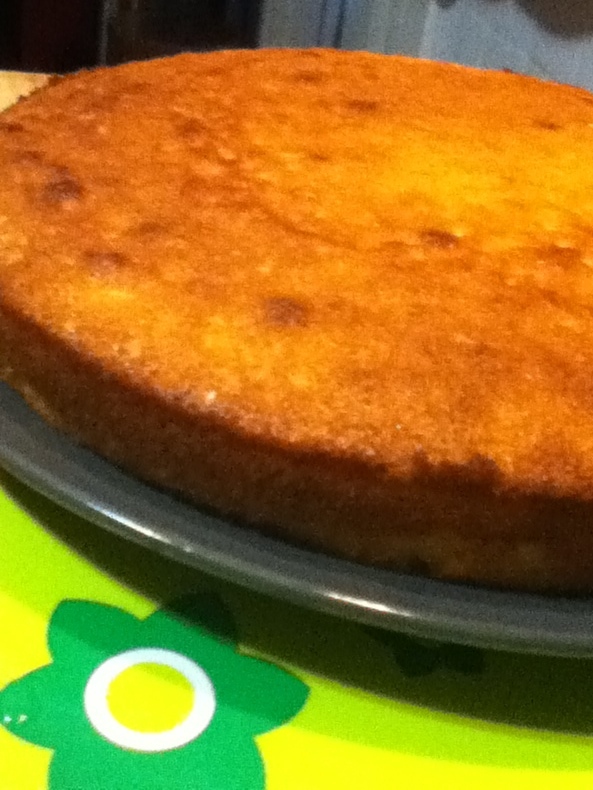 And the cake they wanted was suji (aka sooji aka sugee aka semolina) cake. Suji is the coarse, purified wheat middlings of durum wheat – and it is an extraordinary and much used grain all over the world. The Italians use it to make pasta and pizza and breads. Indians use it to make dosa and uppam. And the list goes on and on. I have posted a recipe for white chocolate semolina pudding that sent some friends into total ecstasies. I love suji, and suji cake is a particular emotive memory for me. Malaysians (of all races, creeds and kinds) are very attached to suji cake. Its kind of like our version of pound cake. Buttery, fluffy, rich and yet incredibly simple. It is pure deliciousness. The suji cake of my memory has almonds in it – crushed ground almonds, and little chunks of almonds. You can leave them out, but why would you want to? 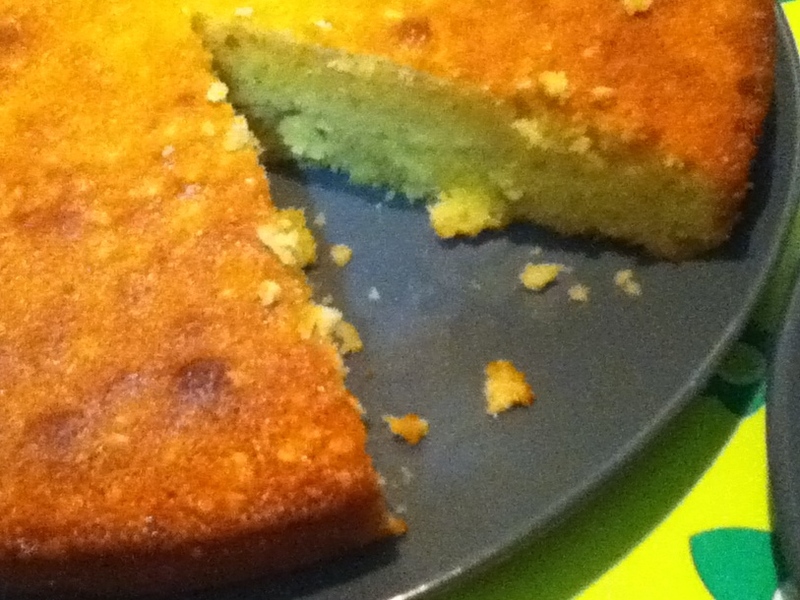 They give the cake a wonderfully grainy texture that stands up to the semolina, and enhances the crumb. We Malaysians serve this little cake at almost all the high holidays, and though many people adorn it (with rose syrup, glazes and icings), I am not in that camp. I like my suji cake plain and unadorned, perfect in its simplicity and golden beauty. For me, suji cake is the ultimate coffee cake. Its not too sweet, its immensely satisfying and very very comforting. When people taste it they smile, and remember a time when things were easier, less complicated, when they were more connected. Its a cake to give to those you love, wrapped carefully in aluminum foil, knowing that they will appreciate it for its clean loveliness as much as you do. But know this. Despite its almost stark simplicity, suji cake does have its secrets. You need to soak the suji in butter, sugar and a touch of milk to allow the grains to plump up a bit. Some recipes ask that you do this overnight, but I am too impatient and have found that about an hour will do me. You need to beat the eggs and sugar for at least five minutes to get air into the mix, but also to get a almost puddingy consistency. And you need to watch the cake – the top burns easily, so I almost always put a little foil cap on it for the last half of the baking time. And it really does help if you have a stand mixer, but a hand held, or your own strength will do – it will just be rather tiring! Start by preparing the suji mixture. In a medium bowl, cream together the butter and 1/2 cup of sugar for about a minute or so, or until light and fluffy and completely combined. Add the cream, and mix briefly – it will loosen up the butter mixture substantially. Fold in the suji by hand, cover the bowl and leave in a cool place to let the mixture really get to combine well for at least an hour, and up to three. Once the hour is up, preheat the oven to 180C (350F) and butter a cake pan extremely well. Line the bottom of the pan with grease proof baking paper, and butter that too. Set aside. Beat together the remaining 1/2 cup sugar, the eggs, egg yolks and vanilla for five minutes. It would help if you have a friendly kitchen gnome to do this for you whilst you get on with other things (that or a stand mixer!). In a small bowl combine the flour, baking powder, salt, ground almonds and almond nibs. Just a note on ground almonds. They tend to be rather expensive, so I often pound almond nibs into ground almonds – this is very easy if you measure out the almonds, stick them in a zip loc bag and bash away with a rolling pin or other heavy object. You can also use a mortar and pestle, but thats sometimes more trouble than its worth. Either way, I always use almond nibs for this recipe, without the skins on, and give them a good whack till they are pulverised. Combine the flour mixture well and set aside. By now, the eggs should have been beaten for at least five minutes. They should have increased in volume, and they will look golden and creamy. Uncover the butter-sugar-suji mix, and get ready to combine everything. Gently, using a wooden spoon or silicon spatula, fold about half of the egg mixture into the butter mixture. Do this quickly, surely and gently. Fold about half of the flour in, and then add the remaining eggs, and finally the remaining flour, folding gently but confidently after each addition. Transfer the batter into your prepared cake tin, and bake, in the centre of your oven for between 30 – 45 minutes. Check at about 15 minutes to make sure the top is not burning, and if it is, cover the cake with a bit of tin foil. The cake is ready when a tester goes in, and comes out clean. Let the cake cool, in the pan, for about ten minutes on a rack. Then turn out onto the rack, and turn right side up again. Cool further, or if you are like me, and your happiness cant wait, serve yourself a slice, warm, crumbly, buttery, almondy, vanillay, delectably evocative, warm from the oven.